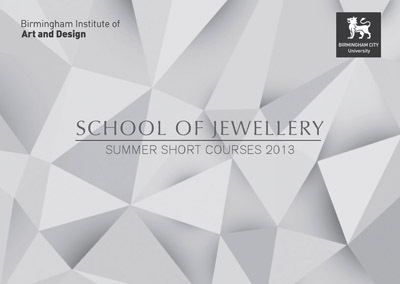 The School of Jewellery launched its highly acclaimed summer programme of inspirational and affordable short courses this spring. Their courses have been continuously developed over the last 20 years and are taught by the very best practitioners from the jewellery industry in the School’s well-equipped contemporary workshops, making the School of Jewellery the ideal place for professionals or beginners to obtain expert training, make useful jewellery industry contacts and enjoy learning in the heart of Birmingham’s historical Jewellery Quarter. Electroforming, Polishing, Anodising & Colouring Aluminium, Enamelling, 3D Scanning/CAD, Laser Welding (Rofin), Resin Jewellery & GRS Pave Microsetting. Bespoke one-day sessions can be arranged at any time subject to tutor availability.